UP Board Result Helpline Number, UP Board Enquiry Number For 10th UP Board 12th Board Exam Result Complaint, Enquiry Numbers, UP Board Shikayat For Farzi, Correction in Marks, UP Board 2019 Result Improvement, up board improvement number. UP Board Result Helpline Number 2019 After Result Intermediate and High School in UP Board, Many students faced challenges after watching their name is not correct in UP Board Result, Father Mother Name is not correct and most important thing is your Maths Stream is changed into Biology Stream. 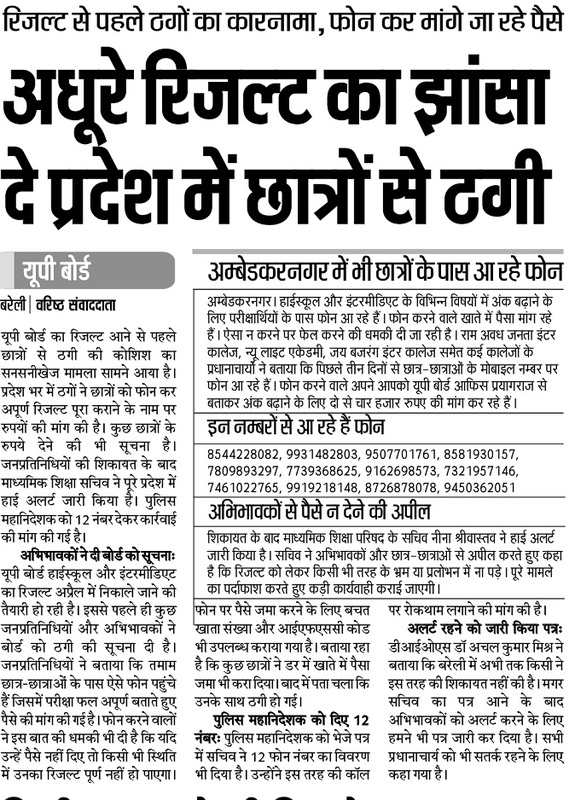 How to Make Duplicate Mark sheet of UP Board: Latest News 13 April is Fake Call Started making by some agents who claiming to make good result of those guardians children who believes their children unable to pass in this UP Board 10th 12th Exam Result. To Increase the number of that subject whom you may not be passed. With Cash and Money transfer in account number for increasing marks in Intermediate and High school Ambedkar Nagar district of UP many fake Call done by some unknown numbers. Agent Numbers List Who Make UP Board Mark sheet: DIOS Dr. Achal Kumar Mishra said relapsed letter to all Board office under his command that every Principal, Teacher and Officer should not involved in that type of things. 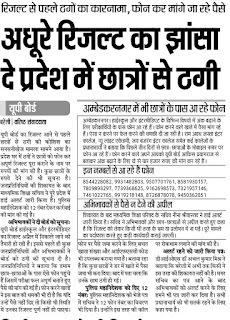 How to Complaint in UP Board if you found Fake Calls: Parents have also complaint to Police and also lodge FIR Complaint about increasing number related fake call. Total 12 Mobile Number has been registered who are calling for increasing UP Board Number before publishing result. How to Increase UP Board Number on Legal Way: You can fill improvement form starting in the month of June 2019. Or directly visit UP Board Office Allahabad. Up Board Subject Failed Result Help Line: It is expected this year up board students passing percent may decline due to strict security. So the number of failed students in 10th & 12th ratio may high.